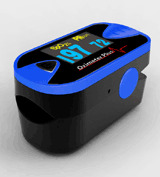 Introducing the Oxi-Go QuickCheck Pro Fingertip Pulse Oximeter. Should be used during sports activities, mountain climbing and piloting airplanes. The Oxi-Go Pro Finger Unit is designed to be used with spot check monitoring. This item should not be used as a medical device. The QuickCheck Pro is excellent with measuring your Blood Oxygen Saturation (in % SpO2) as well as your pulse rate. The QuickCheck Pro is made with a High Resolution easy to read LED display. This devise is capable of reading SPO2: 35-99%, Pulse Rate: 30-235 BPM and Pulse Rate Bar Graph indicating the intensity of the pulse/signal strength. Has a built-in automatic powering off system after 8 seconds once the finger is removed for a long lasting battery life. Accommodates wide ranges of finger sizes from pediatric to adults. Includes 2 AAA batteries. Display SpO2, pulse rate and pulse bar. 10 Levels of adjustable brightness. Low Power consumption, automatic power off. Intended for Sports and Aviation Spot Check Monitoring.